Here’s the presentation I just gave at Semdial 2012 in Paris. From the proceedings of Semdial 2012. Judgements of taste are an intrinsic part of everyday conversational interactions: people make assessments and agree and disagree with them as a core part of how they participate in activities, create and share knowledge, and manage their relationships with one another. However, these conversational assessments can seem resistant to some forms of analysis in ways that are summed up neatly in the Scholastic idiom “there’s no accounting for taste”. This paper approaches the difficulty of analysing judgements of taste in dialogue by looking at them in terms of the pragmatics of talk-in-interaction. 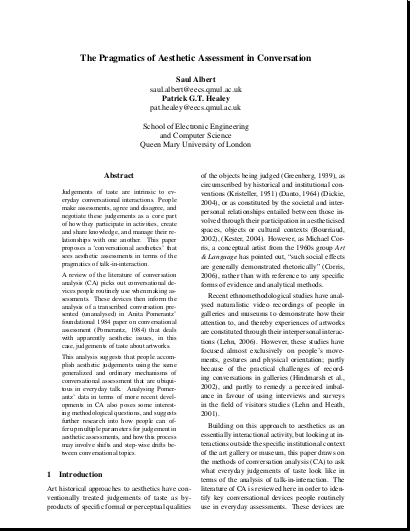 An as-yet-unanalysed example of a conversation about an artwork is drawn from Anita Pomerantz’ seminal Conversation Analytic (CA) paper on conversational assessments, and examined in order to build up a picture of the mechanisms people use when making aesthetic assessments. This analysis suggests that seemingly high-level aesthetic judgements are accomplished using the same ordinary mechanisms of conversational assessment ubiquitous in everyday talk. Some curious features of topic shifting within assessments are discussed, highlighting some methodological issues for this use of CA, and further research into naturalistic aesthetic assessment is proposed.